The celebration of the Eucharist is at the heart of the life of the Church, and it's the source and summit of our Catholic Faith. It is called "Eucharist" because it is an act of thanksgiving to God. Receiving Holy Communion worthily brings us graces that affect us both spiritually and physically. Holy Communion also gives us a spiritual joy in the service of Christ, in defending His cause, in performing the duties of our state of life, and in making the sacrifices required of us in imitating the life of our Savior. On Christ's own promise, Holy Communion is a pledge of heavenly glory, and of our bodily resurrection from the dead (John 6:55). 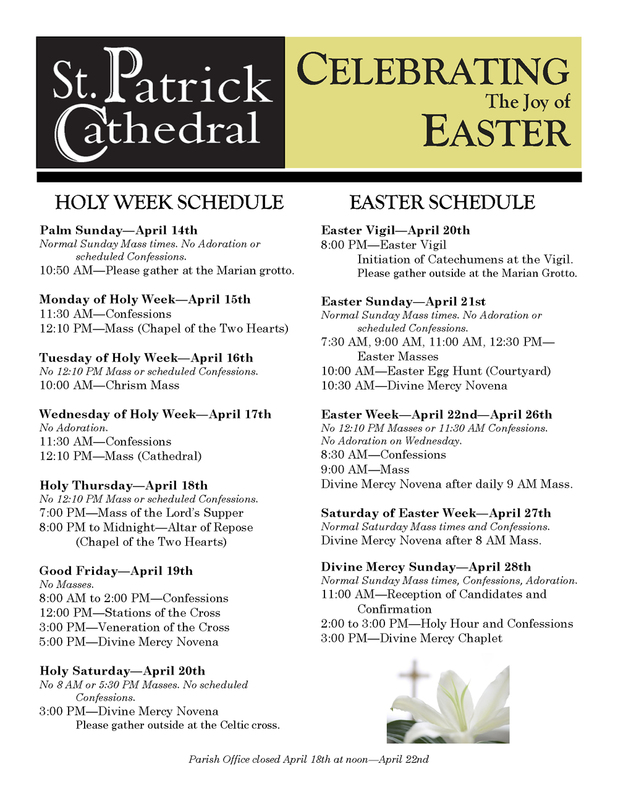 Families of children and youth preparing to celebrate First Holy Communion must be registered and active at the Cathedral of Saint Patrick, and the child must be baptized in the Catholic Church. Families must be able to present the child's Baptismal certificate prior to the child receiving the Sacrament. It is possible for children who are not parishioners of the Cathedral to receive their First Holy Communion at Saint Pattick's if the parents are able to provide verification that they are registered members of a Catholic parish within the Diocese, and if the pastor of that parish provides written permission. Children who will receive the Sacrament of Holy Communion must have attended an approved religious education program in either a parish, Catholic school or approved home school program with regular attendance for two years prior to the Sacrament (at least one year prior, and instruction during the year of the Sacrament). The Diocese of Charlotte requires that students who attend religious education at the parish miss no more than three (3) Sacrament Preparation classes. Should the number of absences be exceeded, the pastor will have to consider having the child repeat the grade the following year. For children who are older than the traditional preparation year for a Sacrament, and have not yet celebrated that Sacrament, special arrangements must be made through the Faith Formation office. What are the guidelines for my child to receive First Holy Communion? Families of children and youth preparing to celebrate First Holy Communion must be registered and active at the Cathedral of Saint Patrick, and the child must be baptized in the Catholic Church. Children who would like to receive the Sacrament of Holy Communion must have attended an approved religious education program in either a parish, Catholic school, or approved home school program, including regular attendance for two years prior to reception of the Sacrament. What if my child is older then 7 and hasn't made their First Holy Communion? For children who are older than the traditional preparation grade level for a Sacrament, and have not yet celebrated that Sacrament, special arrangements must be made through the Faith Formation office. When does First Holy Communion take place? First Holy Communion for second graders is usually scheduled in early May for those children who meet the requirements. What is necessary to receive Holy Communion worthily? To receive Holy Communion worthily, it is necessary to be free from mortal sin, to have right intent, and to obey the Church's laws on fasting required before Holy Communion out of reverence for the Body and Blood of Christ.